Not sure about you, but we just finished carving our pumpkins this past weekend. I always tell people don’t get rid of the good stuff, meaning the guts and seeds. With the seeds you can roast them with a little olive oil and sea salt. They are such a delicious snack. The guts can be made into a pumpkin puree, which means you can make some pumpkin cookies, pies, hummus or you can use it for soup. I didn’t just want this soup to be pumpkin though. I wanted to add a little more nutrition to it so I added some red lentils. The spices that I used in this soup really made my house smell like fall. If you didn’t carve a pumpkin its okay. Go to the store and buy some canned pumpkin puree. It’s beggining to get chilly outside (at least here in Pennsylvania) which means this is a great way to warm up. Enjoy!! In a large Dutch oven or saucepan turn on medium heat. Drizzle in olive oil, and add onions. Cook for about 1-2 minutes then add garlic. Afterwards mix in lentils and stir. Then add puree and stir again. Lastly, mix in stock and let cook for about 30 minutes or so on medium to low heat. You can blend and make this a smooth soup or leave the texture. I did half and half. Next Post Homemade Delish and Pretzel Crisps Contest!! It sounds wonderful! I definitely will be trying this one out. Looks delicious… I love anything pumpkin! This is perfect for us! We are carving pumpkins this weekend and I love lentils! Can’t wait to make this next week. Awesome recipe. I just bought a bag of lentils so I definitely want to try this! 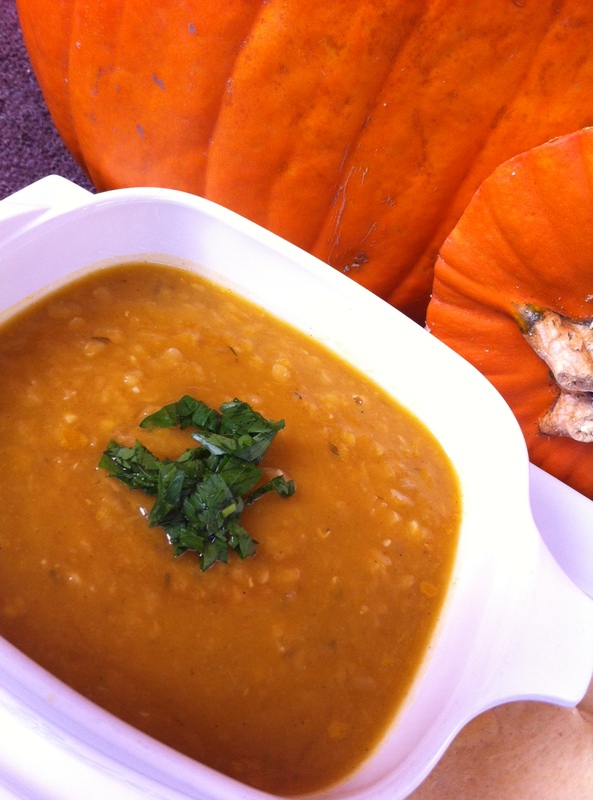 Pingback: Pumpkin Lentil Beer Soup | Eat, Drink, Be Healthy!